Barack Obama refused to have a headline sponsor for the Inauguration. However, the size of this event means that the Inauguration offers advertisers a great platform / opportunity to associate products with the positive messages of 'Hope' and 'Change' on a historic day for America. After taking over a Japanese subway train last year, IKEA have taken things to a new level at Union Station where they have created an IKEA Oval Office. IKEA also have a mock motorcade driving around Washington DC for 2 days and have created a virtual Oval Office online at www.embracechange09.com. Online users can add virtual IKEA furniture to the Oval Office and can then send their suggestions to both their friends and the White House! 2) Fort Lauderdale's beach on wheels! Fort Lauderdale Convention and Visitors Bureau are taking a mobile beach to Washington DC for the inauguration. The beach is on an flat bed truck, has already toured various US cities (even going abroad visiting the North of England recently) and advocates "a change of weather, a change of scenery!" "During inaugural week, Dunkin' Donuts customers can enjoy a special new "Stars & Stripes" donut, a frosted donut decorated with red, white and blue star-shaped sprinkles. The new donut is available at participating Dunkin' Donuts shops nationwide for $0.89 from Saturday January 17 to Friday January 23." Dunkin Donuts Inauguration full press release here. 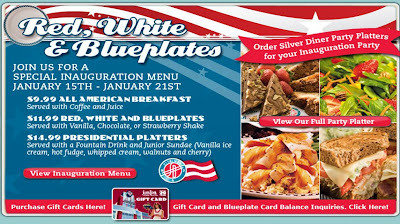 In Autumn 08 Silver Diner's in the Washington area introduced the 'Obamalette' to their menu. To celebrate the Inauguration they are taking this further and adapting most of their menu to coincide with the big day - 'Barack & Biden Bacon Cheeseburgers' for everyone! I wrote a full review of this in a previous post. Facebook and CNN are combining their products to allow internet viewers of the Inauguration to update their Facebook accounts from inside the live CNN stream - meaning they don't have to leave the live broadcast to communicate with friends or share their opinions. Pepsi have launched a major re-brand with new logo and new slogan. The re-brand is being supported with significant ad expenditure and the Inauguration is being heavily targeted with Pepsi marketing. The 'Refresh Everything' slogan has a good fit with Obama's message of 'Change', so Pepsi will break new ads in Inauguration coverage and Pepsi sampling teams will have a significant presence on the streets of Washington DC over the next few days. 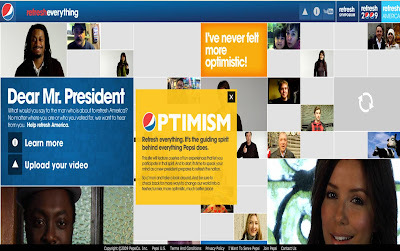 Pepsi have also taken the 'Refresh Everything' idea to the web. Pepsi have been using the internet to co-ordinate a number of real world debates, check the Refresh Everything symposium here, and for the Inauguration Pepsi have created a User Generated 'Dear Mr. President' area, where consumers are encouraged to upload a video telling Barack Obama what he should refresh. Last year 'Honest Tea' (iced-tea drinks) got a boost when Obama was seen drinking their product whilst on the campaign trail. 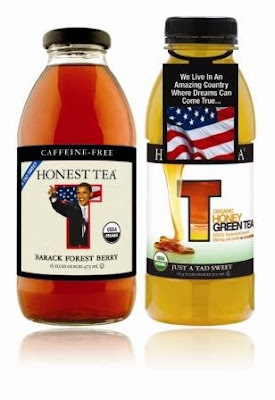 To commerate the Inauguration Honest Tea have created a limited number of bottles that have Obama's image on the label and the flavour changed to "Barack Forest Berry". Honest Tea 'Barack Forest Berry' samples will be given out around Washington DC throughout the Inauguration. The Inauguration flavour is also featured on the Honest Tea Facebook Page here. Microsoft Photosynth is technology that allows the 3D virtual recreation of places and spaces. CNN are planning to use Photosynth as part of their coverage and the Inauguration will see it brought to a mass audience for the first time. "We'll take your photos from every angle, combine them with CNN's professional shots, and produce what we hope will be an amazing experience that will be shown live on CNN. And you thought the Jessica Yellin hologram was cool! The synth will also be available for everyone to see on CNN.com." For more on this and links to online demos of the software check Adjoke here. The TV shopping network has paid a fee to broadcast live on from the Creative Coalition's Inaugural Ball. QVC will sell even more Obama election memorabilia (over 100,000 items to date) and presenters will join in the spirit of the evening by wearing ball gowns. Coverage will include the auctions as usual, but will also include live ball coverage too. 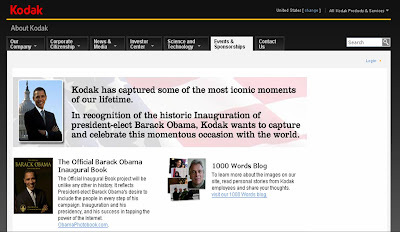 Kodak are using Search to promote an Obama Photobook through their website at www.kodak.com - the homepage is dominated by an image of Obama! Have I missed anything? Let me know in the comments if anything else should be on this list! 11) Legoland host a full ceremony with buildings and characters all assembled from Lego bricks! Obama takes oath in Legoland! The Spider-man comic has released a special Inauguration issue and inside Spider-man meets Barack Obama! The issue was put together after Marvel learnt that Obama is a Spider-man fan and the Inauguration issue sees Spider-man trying to prevent the Inauguration ceremony being disrupted by one of his 'oldest foes'. Full details on the Marvel website here. 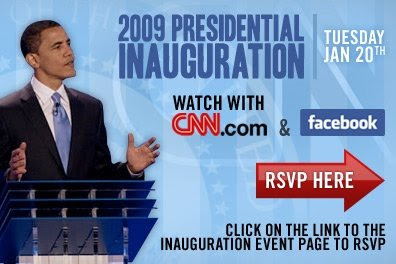 Well we must also consider what are the factors in Obama’s marketing campaign on Presidential inauguration. What about the Spider-man special edition comic that features Obama?